Thesis deadlines are approaching fast! 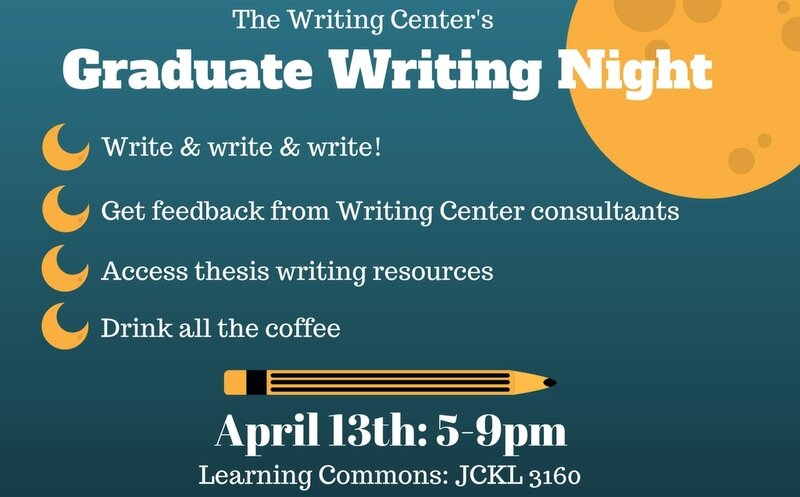 Graduate Writing Night on Thursday, April 13th offers a dedicated time and space for graduate writers to make progress on their theses, research projects, and other writing tasks. With both quiet and more interactive work-spaces available, graduate students will have opportunities to focus on their writing and to collaborate with other writers. Writing Center staff will be available to answer questions, provide support, and connect writers with additional resources. Coffee and snacks will also be provided. Students are welcome to join us for the entire event, a few hours, or wander in and out through the evening. Free to all UCM graduate students!